This article highlights how the steel construction sector has been working behind the scenes towards achieving CE Marking. Perhaps more importantly, it spells out in detail what it will mean for the rest of the construction sector and what you need to do to comply with the Construction Products Regulation, which is the legal basis for the new regime. Dale Barnard, ex SHEQual & Sustainability manager, Bourne Construction Engineering Ltd. 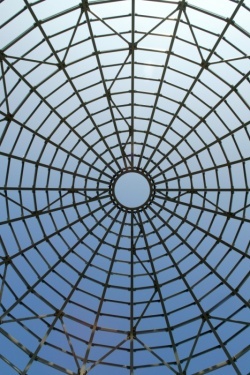 Under the Construction Products Regulation (CPR), new legal obligations have been placed on manufacturers, distributors and importers of construction products used within the EU to CE Mark their products where they are covered by either a harmonised standard or European Technical Assessment (ETA). 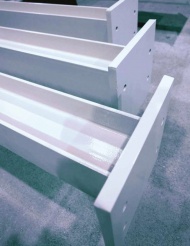 This applies not only to constituent products (such as steel beams, bolts etc) but also to fabricated elements and systems made from both CE Marked and non-CE marked products. In the UK, Trading Standards is the enforcement agency for non-compliance. Penalties for non-compliance include suspension notices, prohibition notices, notices to warn, and application for forfeiture. For certain offences the penalties may include a fine, imprisonment or both. The CPR required the CE Marking of all construction products from 1 July 2013 and the CE Marking of fabricated structural steelwork from 1 July 2014. The CPR describes the legal obligations it places on the construction supply chain in terms of ‘manufacturers’, ‘distributors’ and ‘importers’. However, the construction supply chain in the UK would normally be described in terms of clients, designers, specifiers, contractors and specialist subcontractors. The purpose of this article is to provide some guidance to the UK supply chain on the implications of the CPR on steel construction. 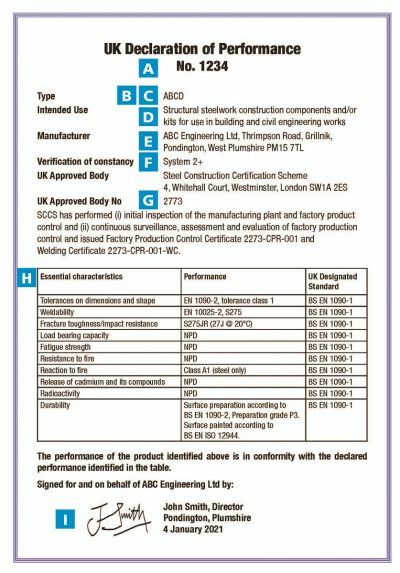 The requirements of the CPR and CE Marking apply to construction products used on a project irrespective of whether that project was designed to National Standards (e.g. BS 5950) or to the Eurocodes. 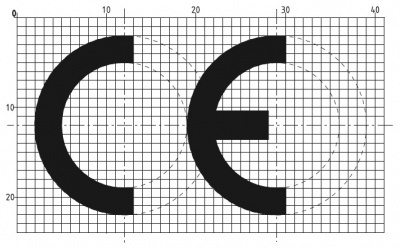 Under the CPR, all products used in construction must now have CE Marking to demonstrate compliance where either a harmonised standard or an ETA is in force. All mainstream construction products are covered by harmonised standards and must therefore be CE Marked. 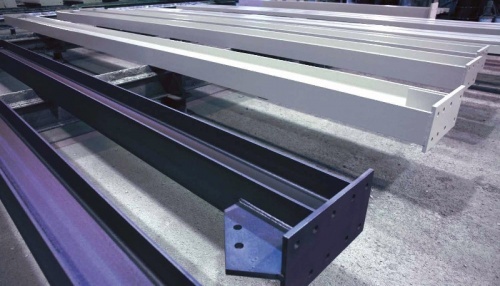 For fabricated structural steelwork, engineers, contractors and steelwork contractors should have amended their specifications accordingly to ensure only CE Marked products are used on their projects. Manufacturers must publish declarations of performance for their products. 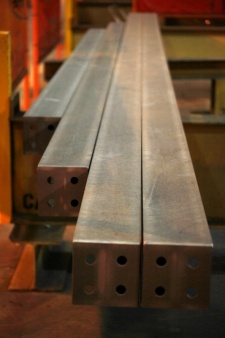 Tata Steel has published declarations of performance for its Celsius® 355 and Hybox® 355 structural hollow sections, and British Steel's declarations of performance for its open section range are available here. Similarly, ArcelorMittal has published declarations of performance for its section ranges here. A full list of harmonised standards can be found on the EU’s Nando website. BS EN 1090-1 became mandatory on 1 July 2014. It is now therefore a legal requirement for all fabricated structural steelwork delivered to site to be CE Marked. 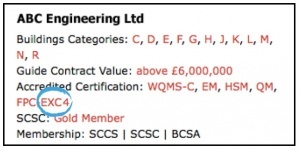 The BCSA has made CE Marking compliance a condition of membership of the Association, so selection of any BCSA Member company guarantees that the steelwork contractor has the necessary certification to comply with the CPR requirements. Clients and main contractors can therefore have confidence in the complete supply chain for steel construction from manufacture of the steel sections through distribution to fabrication and erection on site. The engineer is responsible for specifying the Execution Class for the structure (the works as a whole), and for components and details where it is appropriate to specify an Execution Class different to that specified for the structure. Where different, the Execution Class for a component or detail should not be lower than that specified for the works as a whole. The Execution Class for a component or detail should be clearly identified in the execution specification if it is different to the Execution Class for the structure. Whilst each building needs to be considered on its own merits, Execution Class 2 (EXC2) will be appropriate for the majority of buildings constructed in the UK. If the Execution Class is not specified, clause NA.2.27.2 of the National Annex to BS EN 1993-1-1 states that it should be assumed that the design rules in BS EN 1993 are safe for classes up to and including Consequences Class 2. It should also be noted that the NSSS for Building Construction (6th Edition) has been written for the steelwork contractor to deliver the requirements of EXC2. The purpose of categorising the Consequences Class (CC) is to ensure that buildings are constructed with the appropriate level of quality control within the fabrication process. The Consequences Class for a building is derived on the basis of building type, building height (number of storeys), floor plan area per storey (for retail) and occupancy. A structure, or a part of it, could also contain components with different Consequences Classes. Table 11 of Approved Document A may be used to determine the Consequences Class for a range of building types and occupancy. In Table 11, CC2a and CC2b are subdivisions of CC2 when determining the Execution Class required for a structure. 1 Houses not exceeding 4 storeys. Buildings into which people rarely go, provided no part of the building is closer to another building, or area where people do go, than a distance 1½ times the building height. 5 storey single occupancy houses. Hotels not exceeding 4 storeys. Flats, apartments and other residential buildings not exceeding 4 storeys. Offices not exceeding 4 storeys. Industrial buildings not exceeding 3 storeys. Retailing premises not exceeding 3 storeys or less than 2,000m2 floor area in each storey. All buildings not exceeding 2 storeys to which the public are admitted and which contain floor areas not exceeding 2,000m2 at each storey. Hotels, blocks of flats, apartments and other residential buildings greater than 4 storeys but not exceeding 15 storeys. Educational buildings greater than 1 storey but not exceeding 15 storeys. Retailing premises greater than 3 storeys but not exceeding 15 storeys. Hospitals not exceeding 3 storeys. Offices greater than 4 storeys but not exceeding 15 storeys. All buildings to which the public are admitted and which contain floor areas exceeding 2,000m2 but less than 5,000m2 at each storey. Car parking not exceeding 6 storeys. 3 All buildings defined above as Consequences Class 2a and 2b that exceed the limits on area and/or number of storeys. Grandstands accommodating more than 5,000 spectators. Buildings containing hazardous substances and/or processes. For buildings intended for more than one type of use the Consequences Class should be that pertaining to the most onerous type. In determining the number of storeys, basement storeys may be excluded provided such basement storeys fulfil the robustness requirements of Consequences Class 2b buildings. BS EN 1991-1-7 with its UK National Annex also provides guidance that is comparable to Table 11. As note 1 of Table 11 states, the Consequences Class for a mixed use building will be that pertaining to the most onerous occupancy type. Table 11 presents the Consequences Classes for the buildings it considers in a helpful but generic way. Where a building falls just outside the threshold of CC2 in Table 11, designers may wish to determine the Consequences Class from first principles to see if CC2 can still be applied. Section 5.4 of Approved Document A sets out this alternative approach. Having determined the Consequences Class for a building, the required Execution Class is simply derived from Table NA.4 of the National Annex to BS EN 1993-1-1 (see below). 1. or a distinct, clearly identifiable zone of a structure. For the majority of buildings constructed in the UK, EXC2 will be the appropriate requirement. If the Execution Class is not specified, clause NA.2.27.2 of the National Annex to BS EN 1993-1-1 states that it should be assumed that the design rules in BS EN 1993 are safe for classes up to and including Consequences Class 2. The engineer should always derive the Execution Class based on the design parameters appropriate to each project. The requirements to each Execution Class are listed in Table A3 of BS EN 1090-2 and can be reviewed by the engineer if desired. However, the engineer should avoid overspecification of the Execution Class wherever possible to avoid unnecessary costs being introduced. For example, EXC2 is the Execution Class derived for a project but the engineer requires full traceability (an EXC3 requirement) instead of the partial traceability requirement of EXC2. Rather than specifying EXC3 on the basis of achieving this single Clause requirement, it is suggested that EXC2 is still specified but with the higher level of traceability added to the specification. The notified body will then issue a FPC certificate and Welding Certificate identifying the Execution Class that the steelwork contractor has achieved. For all fabricated structural steelwork delivered to site there is a legal requirement under the CPR that it is CE Marked. In order to achieve this, the client or main contractor should appoint a steelwork contractor with an Execution Class equal to that required for the project. It should be noted that steelwork contractors with EXC3 capability can be used for EXC1, 2, & 3; and a steelwork contractor with EXC2 capability can only be used for EXC1 & 2. The directories for buildings and bridgeworks on BCSA’s website include details of accredited certification levels achieved by each member. Clients and main contractors can use this to find steelwork contractors with an Execution Class equal to that required for their project. The BCSA has made CE Marking compliance a condition of membership of the Association, so selection of a BCSA Member company ensures that the steelwork contractor has the necessary accreditation to comply with the CPR requirements. Contract documentation should also be updated to incorporate the NSSS (6th Edition), which incorporates the obligations of BS EN 1090-1 and BS EN 1090-2 on the steelwork contractor. It should be noted that if a non-EU steelwork contractor is used on a project, the CPR puts liability on clients and/or main contractors. In that instance, the party engaging the steelwork contractor would be classed as an importer under the CPR and must comply with ‘Obligations of Importers’ given in Article 13 of the regulations. The client or main contractor engaging the steelwork contractor should carry out due diligence before appointing them. Likewise, insurers should complete a similar due diligence process before giving Professional Indemnity insurance to steelwork contractors who want to CE Mark their products. As the BCSA has made CE Marking compliance a condition of membership, simply selecting a BCSA Member will ensure compliance with the regulations. The client, main contractor or insurer would not need to carry out due diligence of the steelwork contractor in this case since it has already been undertaken by the BCSA as part of its membership audit. Declared performance – ensure that the steelwork contractor meets or exceeds the Execution Class requirements for the project. 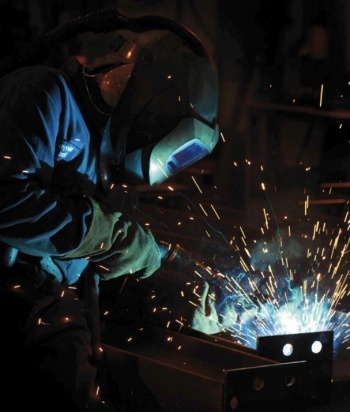 Base materials – the steelwork contractor is covered for welding with material strength and subgrades up to and including those declared on the Welding Certificate. Ensure that these are consistent with the requirements of the project. Date of next surveillance – check that the certificate is still current and covers the period of the contract. Notified body number – check on the EU’s Nando website to ensure that it is a valid and current number associated with the notified body named on each certificate. The scope of the DoP to be issued by the steelwork contractor for each project is set out in Article 6 of the CPR, with a standard form included as Annex III. The standard form in Annex III covers all aspects of the CPR, whereas the example below suggests what would be appropriate to include when CE Marking fabricated structural steelwork along with some comments that might be helpful in interpreting the intent of the DoP standard form. Steelwork contractor’s unique DoP Certificate identification number. Steelwork contractor defined (may be omitted if not relevant). Brief description of use, which may include project name and location. Check that notified body and level of assessment declared is consistent with the FPC and Welding Certificates where appropriate. Steelwork Contractors are not required to declare performance against all of the performance characteristics in Table ZA.1 of BS EN 1090-1, but only those that are appropriate and for which they are responsible. European Organisation for Technical Approvals (EOTA).